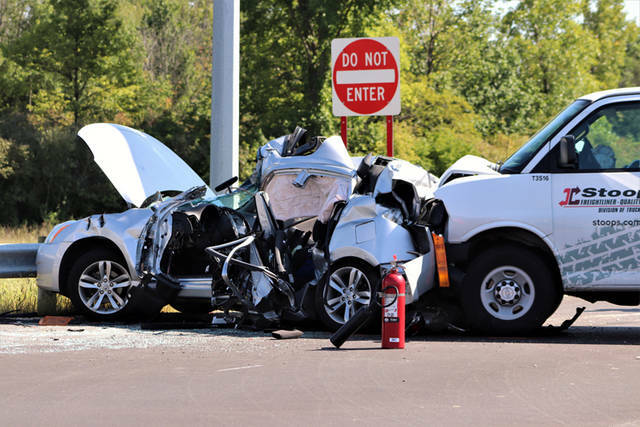 A 64-year-old man from Celina was transported to Miami Valley Hospital by CareFlight following a three-vehicle crash at U.S. Route 127 and State Route 121 on Thursday. 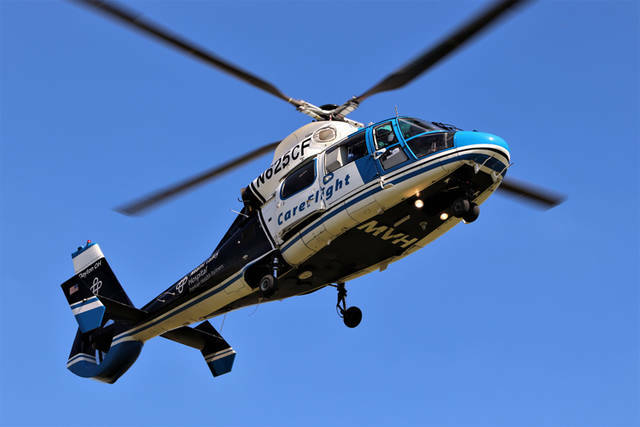 GREENVILE – A multiple car accident left a driver airlifted with what is described as serious injuries. At approximately 2:40 p.m. Thursday, first responders from Greenville Township Fire and Greenville Township Rescue along with deputies from the Darke County Sheriff’s Department and additional assistance from the Ohio State Highway Patrol were dispatched to the area of U.S. Route 127 and State Route 121 to a serious injury accident with entrapment. 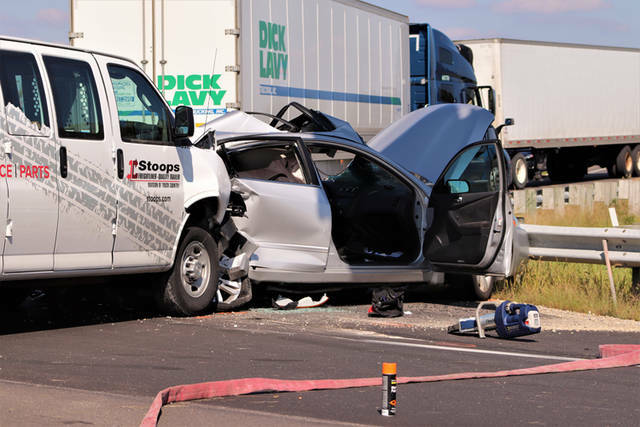 According to the Darke County Sheriff’s Department, preliminary investigations revealed a 2011 silver Nissan Altima, driven by 64-year-old Garry Gray of Celina, was traveling northbound on U.S. Route 127 when it slowed for a 2019 Volvo tractor and trailer, driven by 50-year-old David Bullard of Ansonia, attempting to make a right-hand turn onto the State Route 121 onramp. 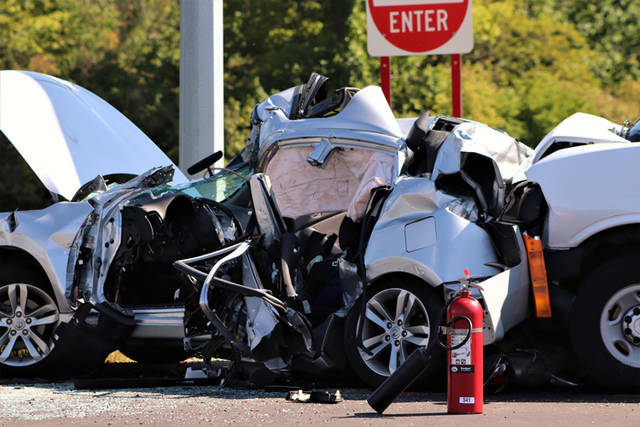 The Nissan Altima was struck from behind by a 2017 Chevrolet Express Van, driven by 25-year-old Dustin Underwood of Greenville, and pushed into the rear end of the Volvo tractor and trailer before coming to rest against a guardrail. Gray had to be extricated from his vehicle by mechanical means by Greenville Township Fire before being treated for his injuries by Greenville Township Rescue and transported to Miami Valley Hospital by CareFlight. Both the drivers of the Chevy van and the Volvo tractor and trailer were uninjured in the accident and refused treatment on the scene. This entry was tagged Ansonia, Careflight, Celina, crash, Darke County Sheriff’s Department, Greenville, Greenville Township Fire, Greenville Township Rescue, Miami Valley Hospital, Ohio State Highway Patrol. Bookmark the permalink.